The above survey was made for F. D. Sweetser in November of 1892, preparatory to his selling the paper mill to the Columbia Paper Company. The paper mill lay between the feeder and the west side of the Fox river, south of the bridge. The main body of the factory consisted of the machine room, the beater room, and the bleach room, with the boiler room at the back. The plat shows the water diverted from the feeder to power the machinery and then returned to the river. The lime house appears just north of the main building. The paper was made from straw and made a low-grade wrapping paper. In 1886 the paper mill was turning out about six tons of this paper per 24 hours. Although the river provided the power the mill needed, it could also bring trouble. In February 1887 the river flooded and the mill was closed for several weeks until repairs could be made. The flood also washed away all the straw that was stockpiled to last out the winter. 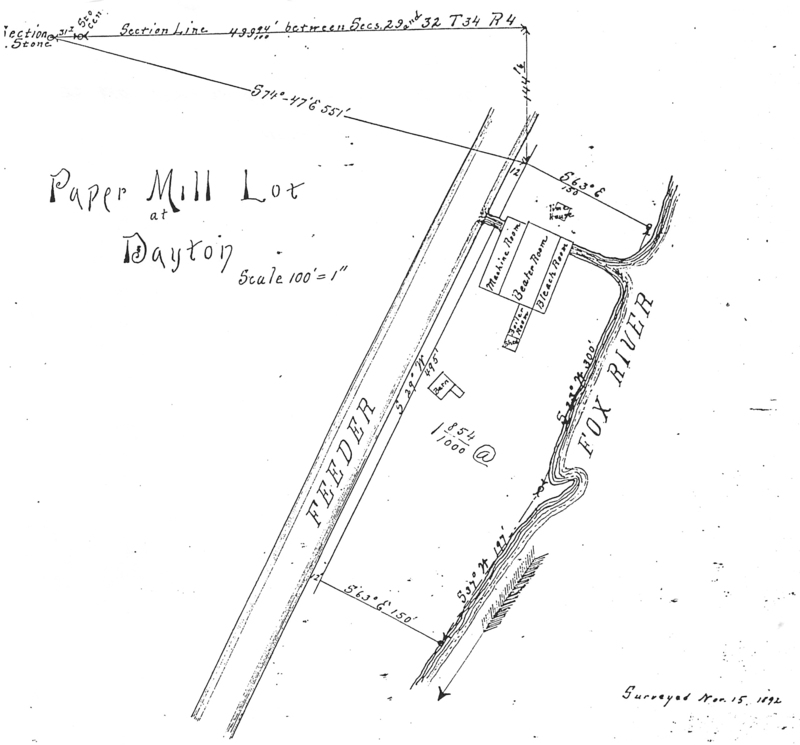 At the time of its sale in 1893 to the Columbia Paper Company, the mill was Dayton’s chief industry. Unfortunately, the new owner closed the mill and the heyday of industrial Dayton was nearly at an end.